Relax, connect within, and feel deep inner peace with this exquisite guided meditation from one of the world’s leading experts in healing imagery. Gentle narration, a magical script, and soothing original music gracefully combine to deliver an unforgettable experience! 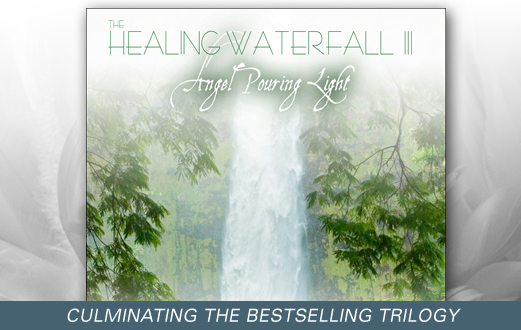 This is the long awaited third installment in the Healing Waterfall Trilogy from Max Highstein. The new program, The Healing Waterfall III: Angel Pouring Light, carries forward the theme — a serene forest walk and a waterfall with a soothing pool below, where the listener can float and drift in curative waters. Professional narration, a custom music score, and high production values throughout all contribute to a guided inner journey to be enjoyed over repeated listenings for years to come. "Looking up at the waterfall, you see the angel once again, still pouring light into the water. It seems as if she’s been there forever, and your breath catches for a moment as she meets your gaze, making contact with you directly. She sees you, knows you’ve come to receive her gift, and welcomes you to her world. If you like, float on your back, and feel your whole body embraced by the light-filled water, as it seems to cradle and invite you to feel totally relaxed and free..."
While there are many guided meditation programs available on the market these days, a number of factors make some stand out above the others. Those factors include: concept, writing, narration, pacing, and background music, all of which are given the highest professional consideration in The Healing Waterfall series. All of this adds up to superior production with a level of quality that listeners can feel and benefit from. For me, it didn’t take long after the meditation started to feel myself becoming immersed in its calm ambiance with the cares of the day beginning to drift away. As mentioned, the soothing music of the piano, keyboards, and flute create the perfect atmosphere for the journey. I also liked little accents like the sound of a rainstick, which enhanced the waterfall imagery. The narrator’s voice has just the right kind of tone and cadence for a guided meditation. I appreciated how detailed the imagery was and the way it draws you into the scene and makes it feel like you are there in this enchanted forest floating in a sacred pool in the company of an angelic presence. By the end, you really feel like you have been somewhere else without leaving your seat. As mentioned, there are many programs on the market for relaxation, stress relief, etc. yet few are on the level of The Healing Waterfall series, with its blend of exquisite music, imaginative scripts, attention to detail, and degree of professionalism. With an impressive background like he has, it is no surprise that Max Highstein has become a leader in the field of relaxation music and guided meditation. I’m glad to have discovered this series and know exactly where to go when I’m in need of a calm supportive space to unwind in. "Returning to The Healing Waterfall to make this third and final installment was like visiting a dear old friend. A deep appreciation of nature, and its ability to restore and heal us of stress, motivated the creation of this program as the ones before. I believe the "real" Healing Waterfall and the all the Angels are within each of us, waiting to be found, offering to make life a little more comfortable, enjoyable, and rich. It's my hope that these programs will help everyone find that peace and healing waiting inside." Small choices produce big results! Five recordings to support your healthy weight loss. Unload your worries, and send them away for good. Then re-envision your life, worry free. Make your car a stress-free sanctuary. An easy to follow guided program for stress reduction and deep relaxation.